The BBC is obsessed with the Impressionists and it can always find somebody to witter on about them. 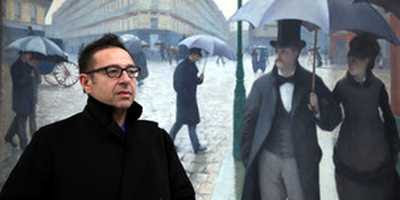 Tonight at 8pm on BBC Two, Waldemar Januszczak explores their "revolutionary achievements" in a new series The Impressionists: Painting and Revolution (title link). Who? He's been art critic and arts editor of The Guardian, Head of Arts at Channel 4 TV and art critic for The Sunday Times. Twice the Press Association has voted him Critic of the Year. His father, a polish refugee, worked as a railway carriage cleaner and died when a train ran over him at Basingstoke Station. I think I'll skip this one. Let me know if I missed anything worthwhile. The painting Januszczak is posed against is Street in Paris - a Rainy Day (1877) by Gustave Caillebotte. Picked it up on iPlayer before seeing your comments. Gave up after about three minutes - that is a record for disillusionment. Replacing the figures in the pictures by singing or grimacing "live" people is a gimmick that wears out very quickly. The narrator clowning about in a hotel - while relegating the pictures to glimpses of small frames on sidetables - made me decide that my daily walk in the sunshine was a better use of my time. As with his series on sculpture - it appears to be more about trendy "entertainment" than an educating study of the artists and their works. Thank you for letting me know. The BBC trailer put me off, but your comment makes it seem ever worse than I imagined. I'm glad I didn't bother.